I have a severe book addiction, a condition which is acute enough that I must constantly visit bookstores and book sales in search of new acquisitions. 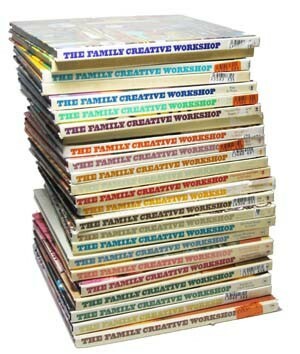 For several years, I encountered the individual volumes of the Family Creative Workshop at used book sales. I’d pick them up and fiddle with them a little. Then, despite the wise old adage “never judge a book by its cover”, I’d rather dismissively put them aside and move on, irrationally convinced that they were dull in the extreme and only fit for recycling. When I did finally inspect one more closely, I realized what a foolish, horrible mistake I’d been making. Published during the mid-70s, this 24 volume set is a comprehensive guide to a mind-boggling array of crafts. As one might expect, the crafts of those times are represented: macrame, string art, mosaics, sand painting, tie dye and terrariums all make an appearance. However, there’s also a noteworthy collection of current mainstream crafts, such as knitting, crocheting and beading, as well as impressive coverage of more obscure topics. Thumbing through volumes at random, I’m greeted by articles on glass working, pinstriping, making metal cookie cutters, and creating paper airplanes. A discussion on making play equipment from cable spools and tires makes me feel especially wistful – if only I had the space! – and articles on making hiking sticks and flutes make me resolve to keep my eyes open for just the right materials. As with any collection, there are articles which don’t interest me. For example, I have no desire whatsoever to make a pair of leather mittens or mukluks, and thank heavens for that. However, someone else might, so it’s nice that the information is available. For every technique that doesn’t interest me, there are twenty or thirty that do. Thanks to the editors’ high production values, the volumes are a joy to thumb through. The articles are well-written and copiously illustrated with color illustrations and photos. The fact that some of the projects reflect the tastes and styles of the time in which they were created just adds to the fun. If you’re a person who enjoys crafting and creating and you can get your hands on a set of these … do. They are a treasure. A perusal of online used book sellers shows that they’re currently massively undervalued, often selling for just a few pennies over the cost of shipping.